Imperfect vessel sink. Has a small blemish (may be seen in the right hand corner of picture). 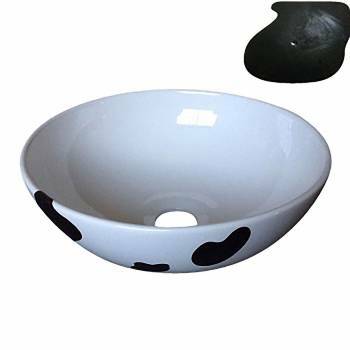 Bathroom Vessel Sink: Above counter Cow design vessel sink made of Grade A vitreous china. Easy to clean wipe off surface. Space saving desing maximizes limited bathroom space. Measures 11 7/8" in diameter and 4" in height.